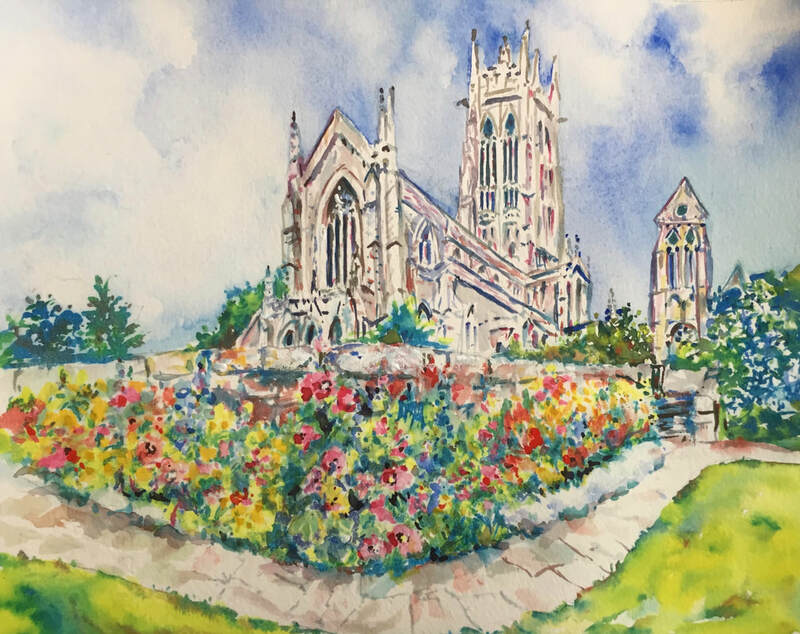 Built of granite from surrounding mines, and studded with world class colored glass, the Bryn Athyn Cathedral stands high and steady over a bucolic valley, as it has my entire life. It has housed my ancestors’ tears of joy and of sorrow, providing majestic walls for their weddings, baptisms and funerals. I sat on ordinary Sundays, next to my Grandmother, sharing a hymnal many times, but she never looked down, since she knew the words to all five verses. I held my father’s arm as I walked up the aisle as a foolish young bride, while he held back his tears. Decades later, I held back my own tears, in my black suit, holding on to my son’s strong arm at my mother’s funeral. 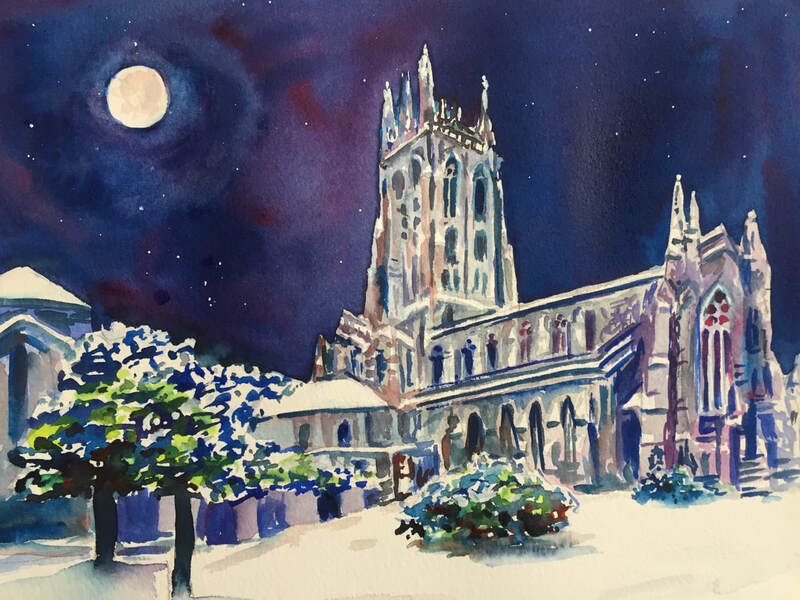 Recently I painted the Cathedral. Four times. Staring intently at details to get them right made me realized I never really looked that closely. In the past, every encounter with the Cathedral was bathed in emotions. As a teen, forced to go, it was resentment and boredom. As a visitor in years later, I was a tour guide full of pride, showing new family members MY church. I had pull, and we got to go up to the tower, climbing round and round the tiny cold iron staircase. My cousin Richard was the guard and guardian, but let us in if we were respectful. We saw the land below, nature preserved by the trust to keep the view intact for generations. Painting the Cathedral hour after hour, I thought about my past with the building, and then the religion it celebrated. The dressing room has a pulley to drop a wedding dress down on the bride. Finally it happened to me one May morning, fulfilling the childhood dreams of marriage – carefully drummed into me by my community. This was the crowning glory of my existence, I thought. Now real life begins! That dress eventually was shredded, and a good part of my better life started after that marriage died, and in the process, a long untangling of my conditioning. I once dreamed the cathedral had been bombed, maybe because of memories of my fifth grade class marching over to the basement from the school, in a drill to protect us from nuclear war. Or maybe, it was my disillusionment with my religious upbringing. These four paintings encompass the territory of my relationship with the church of my youth. ”Faith”, the snow covered building glowing in the moon and starlight, represents the times when I felt no love for my religion, but had scant hope that there still was a God, as cold and dead as I might be feeling. As I picked out stars from the dark wash on the cotton paper, with my knife blade, I remembered a childhood story written by one of the church’s gracious “aunties”, about a girl who died on a porch watching the starry sky, and was brought to heaven. You won’t be able to talk me out of the existence of an afterlife, but my doubts about my religions’ description of it still seem dubious. I cherry pick the parts of my religion I want to keep, and build my own theories upon them. Another painting, “Joy” shows the gardens prominent, and the building in the background. Flowers are part of my personal religion, enhanced by aunts who helped me appreciate and arrange them. The lilac and violet bouquets made for my flower girls by my Aunt Sylvia are as fresh and fragrant in my mind as they were that wedding day. Love is what flowers mean to me, and I got plenty of love from my family. “Rebirth” is the name of the painting from a photo taken from on high via a helicopter. The sunrise shines through the tower, over the early morning darkness of the land and the granite walls. The scene takes in a bigger vista, somewhat dwarfing the importance of the building. This is like my view of my indoctrination into my childhood religion: it is part of a bigger whole. Beautiful, but not the whole story. A spark of belief to elaborate on as life unfolds. 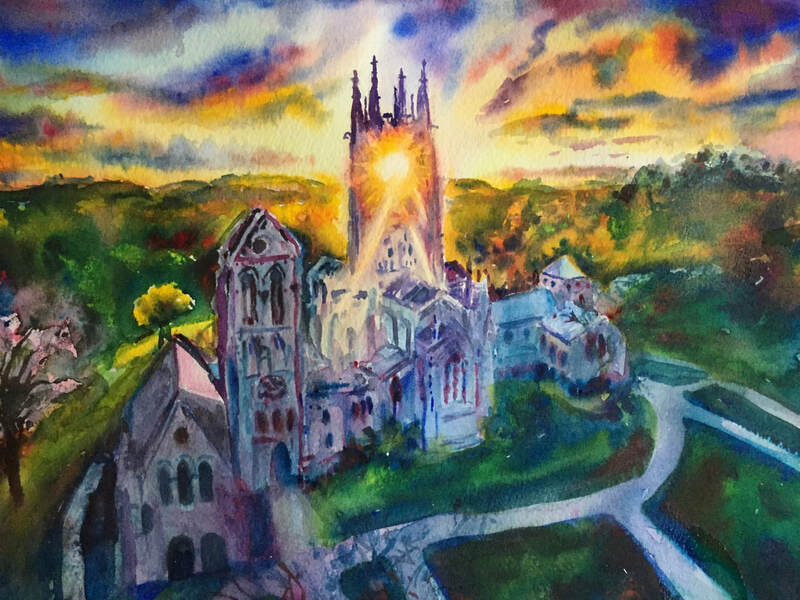 “Holy Spirit” shows the muted cathedral surrounded by a glowing cloud of light. I believe this was the original intention of the architect and instigator of this building: that it be homage to something higher and bigger than us all. He used the tools of his understanding and culture to express this, employing the work of artists to help him bring his vision into being. I have come to look past any misunderstandings of his methods, or the methods of my teachers and family, and see what they were getting at. We all look up and see the sun and the moon and the clouds and the stars, and are equal in our longing for meaning in our troubled lives. We try to share it, as I am in painting the Cathedral and my way of seeing it.